As well as supplying and erecting timber frame house kits which are pre-designed and ready to be manufactured, Vision Development can also manufacture and erect your custom timber frame home to suit your own design you have prepared, or you can work with us to design a home to meet your requirements. We have worked closely with many Self Build Clients to create their own custom designed homes and you can see examples in our Gallery and Blog pages. If you have drawings prepared by your chosen architect, you can send these directly to us via our contact form or via email and we will provide you with a detailed quotation. Our designer can work with you to plan and specify a custom home for you. 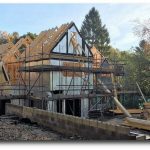 Depending on your location, he can meet with you at site to discuss your requirements and prepare drawings which we can quote from for the timber frame works required. We can modify one of our standard timber frame house kits to meet your own requirements. Please look at our range of Timber Frame House Kits to select the one(s) that most closely meet your requirements and then contact us to discuss what changes you would like so we are able to provide you with a full quotation. Once you have chosen on how you would like us to be involved with the design stage of your build, we then have the following options available to you…. We can simply supply and erect (if required) the timber frame solution made to your design or ours. We can provide and manage (if required) any other products, services or building trades such as groundworks, plumbing, heating, electrics or decoration. We can provide a complete design and build service. We can provide any variation or combination of the above three services if required. All of the above are dependent upon the location of your project in the UK.